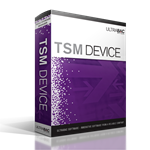 The TSM (Tivoli Storage Manager) Device allows UltraBac to write data to a Tivoli Storage Manager server, where Tivoli's unique storage management features can be leveraged alongside UltraBac's rich client-level backup strengths. UltraBac manages the administration of the backup and restore processes, while Tivoli manages the media that these backups are written to. This allows users with existing Tivoli Storage Manager installations to utilize these processes for their backups, as well as providing an avenue for UltraBac users desiring enterprise-level media management facilities to combine the strengths of UltraBac and Tivoli offerings. The device is built atop the Tivoli Storage Manager API for a robust interface with the Tivoli Storage Manager architecture, and has been qualified for TSM API levels 4.2 and above.